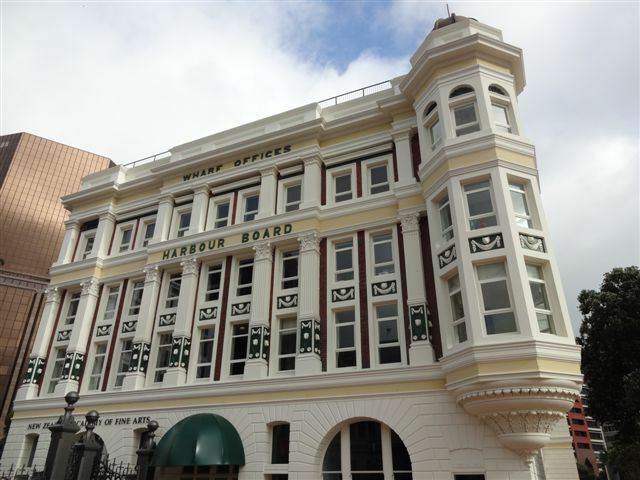 I'm visiting Wellington – my home town. I know ... it's bizarre ... but true. These days I live in Melbourne, so my trips to Wellington are primarily to see family. But somehow, on this visit, I see Wellington with fresh and delighted eyes. I'm staying downtown, very near Lambton Quay and Queens Wharf. It's an ideal location - the drive from Wellington Airport into the city is only about 15 minutes. Fantastic. It's a clear, but blustery spring morning – the wind has a chill to it, but the blue sky and harbour make Wellington welcoming and bright. I head off from my hotel to see what I can see. First European settlers arrived here in 1840 and Wellington's harbour has been shaped by nature and the needs of the growing community and economy ever since. Land reclamation and ongoing earthquakes have both had an impact. The first settlers thought Petone, on the opposite shore, was the best prospect to settle. But there they found the anchorage shallow, water hazards and unpredictable tides, so they relocated here - Lambton Harbour. It wasn't their first choice because this side offered very little shoreline, so they immediately started to create more usable flat land – those with the resources to do it pushed rock from the hills into the sea to create more land and wharves for themselves - the reclamation had begun. This (and later reclamations for commercial reasons) has majorly changed the character of the harbour - and the original shoreline along Lambton Quay is clearly marked in a series of pavement slates. For decades, the Port of Wellington was a very important and busy fixture - until the 1970's most goods and people came and went via the harbour – but of course, these days, it's more likely that freight will move by road, rail or air. However, there are still many leisure, tourist and business craft buzzing around. Inter-island passenger and car ferries run regularly from here to Picton in the Marlborough Sounds at the tip of the South Island - a short (but sometimes pretty exciting) 4 hour journey across Cook Strait. Over the last decade or so, the wharf area, once rejected as a barren wasteland of docks, has been redeveloped and become a hub of activity. There's a marvellous vibrancy here - several restaurants and bars line the walkway towards the harbour and the water's edge is a great vantage point to watch the bustle on the beautiful and vast harbour. I venture west along the boardwalk towards Frank Kitts Park. A dedicated public servant, Sir Francis Kitts was the longest-serving Mayor of Wellington (from 1956 to 1974) - he was active on several Wellington Boards, a Member of Parliament for four years and his public work continued even after his retirement, until his death in 1979. 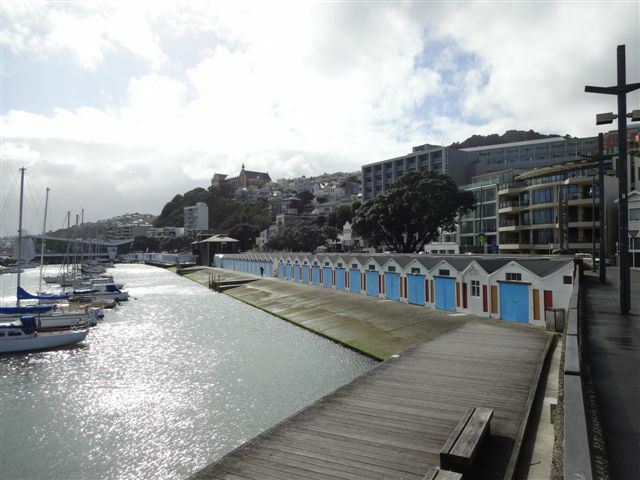 This site was once a series of wharf sheds and I can still see the structures from those times, but now its compact basin-shape offers green lawns and soft areas to relax or picnic (as long as Wellington's weather is being kind!). Along with the inevitable children's playground, there's a beautiful white water sculpture "The Albatross" by Tanya Ashken. Most poignant of all, though, is the foremast recovered from the TEV Wahine which foundered on rocks at the entrance to Wellington Harbour in a hurricane in 1968 and lost 51 lives - a very dark day in the history of Wellington. I remember that day like no other. The park also hosts a plaque that's part of "Writers Walk" – a tribute to Wellington in a series of "typographical sculptures" in panels at regular intervals along the waterfront. 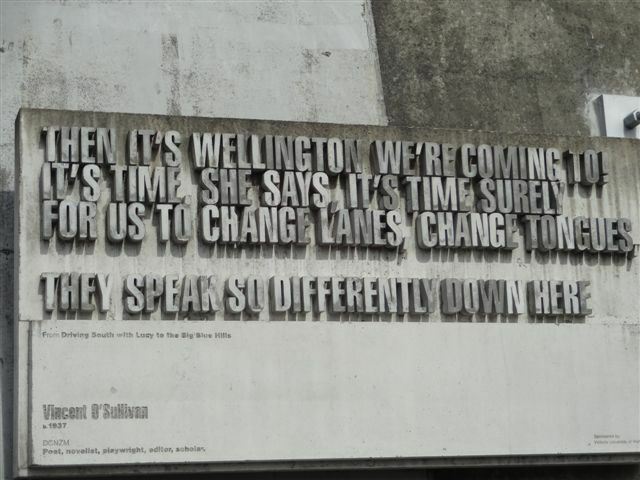 It's a project of the New Zealand Society of Authors where each panel offers a quotation about the city from a poem or piece of prose by one of the talented writers who have made Wellington their home at some stage. I venture further – at this time of the morning, the boardwalk buzzes with commuters making their way to work from their public transport. I dodge cyclists, runners and power-walkers, each with steel-eyes fixed on their destination … or perhaps it's just as they brace against the blustery wind off the sea. 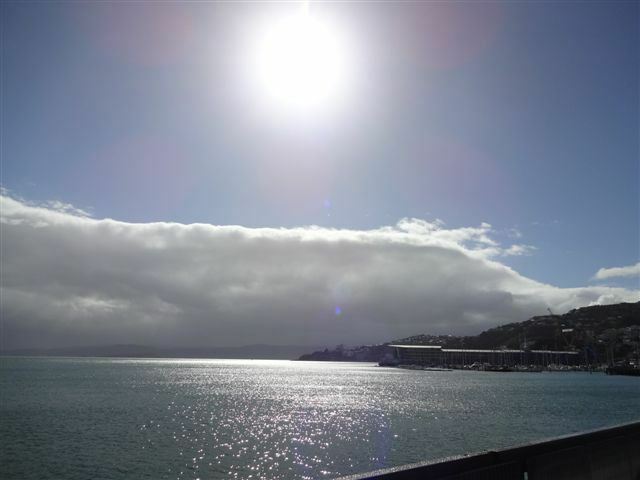 I look up – the sky is dramatic – a huge cloud bank blocks out the sun – but it's bright blue too – yes, this is Wellington. Along this windswept section a series of plaques commemorate a range of significant activities of the harbour and Wellington itself. I'm fascinated to read about the visit in around 1910 of Captain Nobu, a Japanese seaman intent on reaching the Southern Ocean and Antarctica at the same time as Captain Robert Scott was doing it – Nobu called in here with his crew to replenish supplies on his way south. A ship from the NZ Sea Cadets marks its particular support from the people of Wellington during the 1930's when it operated as a training vessel for sailors soon to join the Royal New Zealand Navy - it was also active in its own role during World War 2, then returned to training operations after the war. There's gratitude from a whole community of Polish children who disembarked here in 1944 after their journey as refugees from war torn Poland - they eventually settled in Featherston, about an hour further north, up in the Wairarapa. 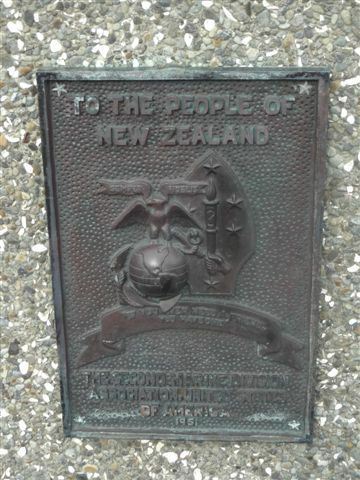 The US Marines give sincere thanks to Wellington too - for the rest and recreation they enjoyed in the early 1940's during their final port of call before they headed to the War in the Pacific. It's really fascinating – this rich tapestry of waterfront life. 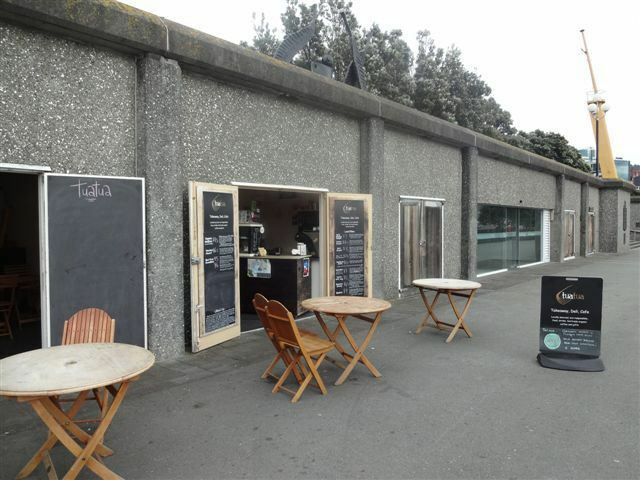 The Tuatua Café opens its doors to the passing throng – somehow its chairs and tables are sheltered along this breezy walkway. It boasts "environmental certification and all the badges". What? I don't understand …. ? The owner tells me it's a Wellington initiative to allow small businesses to proudly demonstrate they've achieved an accredited standard of environmental awareness in various processes – recycling, waste disposal, water usage, free-trade, local produce, composting etc. A badge is awarded for each and these can be pesented to show the achievements of the business – impressively, this café displays many. No doubt, both environmentalists and locavores gravitate here ... the menu uses all locally-sourced produce and it looks marvelous – there's even venison … Gee, I haven't seen that for a while … but where does it come from around here? The barista says it comes from nearby Nelson. It's fascinating and really pleasing to see, it warms my heart. It's easy to find my way along here ... I just follow the boardwalk! I reach Taranaki Street Wharf where the rejuvenated and very appealing Star Boating Club sits right alongside the impressive Te Raukura Centre. Up until the 1880's, this site was the harbour frontage of Te Aro Pā, one of the largest Māori communities in Wellington. But since then there hasn't been a strong Māori presence here until recently. 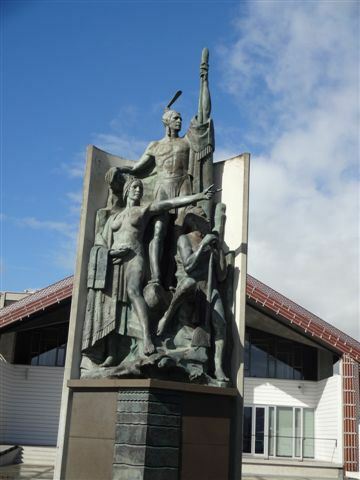 Outside the Centre sits a huge and fabulous statue of Kupe Raiatea, the great Maori explorer, his wife Te Aparangi and their tohunga (expert) Pekahourangi. 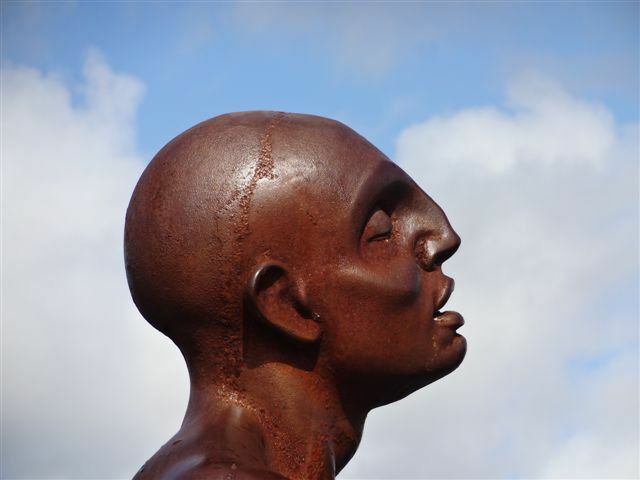 In Maori legend, Kupe was a skilful fisherman in Hawaiiki across the Pacific Ocean. He enjoyed many years of plentiful fish with his village and every time the fishermen returned laden with their catch, the whole tribe celebrated and shared it. But one strange day, no one caught any fish. As this had never happened before, Kupe was determined to find out why. He and the fishermen went back to sea the next day but the same thing happened again. Then he noticed an octopus (wheke) in the water and he knew to stop fishing or the wheke would steal their haul. They returned to shore empty-handed once again. Kupe knew that a Chief on the other side of the island had a pet wheke. He asked him if his pet would know why there was no fish, but the Chief said "no" and that he couldn't stop the wheke anyway, so Kupe vowed to slay it. He built a huge canoe and set off with his wife Hine-te-Aparangi, his family (whānau) and his many warriors. For weeks he battled the fierce wheke across the Pacific. The one morning his wife saw a long cloud in the distance, a sign of land - she named it Aotearoa, the land of the long white cloud. She, Kupe and the whānau were amazed by the beauty of the new land. So it was true! … the story they'd heard so many times as children of Maui fishing a great land from the sea! ... and here it is! They explored this bountiful land to gather supplies then headed back to sea. They chased the wheke down the east coast of the new land until they arrived at a huge open harbour, Te Whanganui-ā-Tara (Wellington Harbour). Kupe's whānau rested here and he and his crew continued on - they finally caught up with the wheke and there was a great sea battle. The wheke's massive tentacles lashed the canoe and a huge hole was smashed in the hull. Kupe jumped onto the back of the wheke and struck - killing it. After such a long absence, Kupe's wife and whanau thought he'd been killed. In mourning, his grandchildren, Matiu and Makaro, slashed their breasts with shells until their blood stained the rocks under their feet. These rocks - near the harbour entrance, are named Pariwhero (Red Rocks). Kupe did return to his whanau and they sailed up the west coast of Te Ika a Maui (the North Island) to Hokianga, where they topped up on supplies and returned to Hawaiiki. The statue is in bronze and really great – it's huge, too - perhaps life size. I can almost feel the sea breeze ruffling through the feathers on Kupe's head. It was designed in 1940 by Christchurch sculptor William Trethewey for the New Zealand Centennial Exhibition and it stood for fifty years in the Wellington Railway Station (to be largely ignored by bustling commuters, I guess). It was then stored as a national treasure until the Kupe Group Trust successfully fundraised to have it permanently located here in 2000. The Museum of New Zealand Te Papa Tongarewa, known simply as Te Papa, is an extensive building with many halls and a range of exhibitions, some permanent and others transient – it's a jewel of Wellington. Outside Te Papa is the beautifully maintained Circa Theatre. Founded in 1976, it's always been known to show "cutting edge" drama and it's a very popular Wellington venue. The exterior is just lovely. The façade is the only remaining portion of the Westport Coal Company's building of 1885. Westport Coal was once the biggest coal supplier in New Zealand. 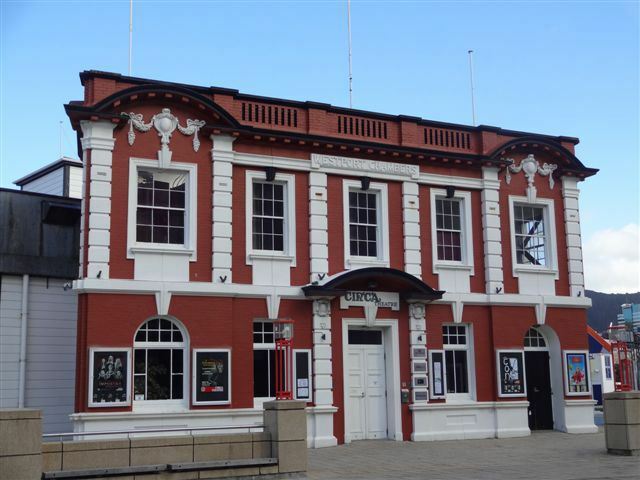 The facade was moved here from its original site across the road and the theatre was designed around it - thanks to architect Graeme Anderson and highly esteemed NZ actor and theatre consultant Grant Tilly. Well, whatever his motivation, this sculpture is stunning. 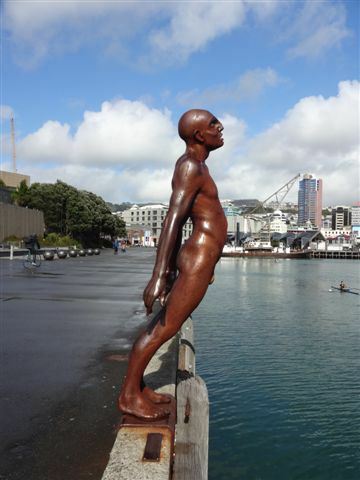 It's by far my favourite along the waterfront - he is superb. Ahead of me, the well maintained blue and white boatsheds of Port Nicholson Yacht Club stand in a row at the marina. These uniform little boxes hail back to another time, but somehow don't look at all out of place here today. The sea gently laps up against the launch ramp and the marina exudes peace and tranquility ... That's the curoius thing about Wellington harbour - due to its geography, the port is almost entirely encircled with high hills (around 300-400 metres) which shelters parts of the city from prevailing sea winds. It means that on any given day, if I stand in one suburb I'll be blown to bits by a howling wind - but move a suburb in either direction and it may be beautifully calm - it's the luck of the Wellington weather draw. Oriental Bay is at the end of the boardwalk. I guess it's somewhat unusual for a capital city to have such a beautiful sandy beach so close to the CBD - it's literally walking distance from shops and offices. Although the beach is small as beaches go, it's a lovely spot - the beach environment is friendly too. New Zealand has very few natural hazards and predators ... sharks are very rare, a swimmer may get stung by a jellyfish and rips do exist in various places around the coastline, of course - but this beach is very good. It's a favourite spot for worker-walkers to take in some fresh air at lunch time or after work - it's easy to sit with a sandwich or cool drink to watch the world go by. There are several good cafes along the beach front too. Fascinating history to read about.